This very unusual and interesting name is English. In its different forms as shown below, it is both locational and ethnic. It derives from the male given name Alban, from the Roman (Latin) Albanus, and originally described a person from any othe places called Alba or Albania. Later it was simply used as a popular given name in France, Germany, and Sweden. In England it was often bestowed in honour of St. Alban, the first British martyr in the 3rd or 4th century. The town of St Albans is recorded in 1421 as Seynt Albanus. The surname was first recorded in the 13th century and early examples included Adam Albon of Worcestershire in 1275; and Hugh Alybon of Derbyshire in 1297. 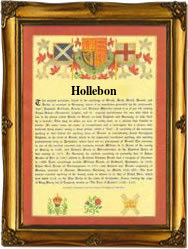 The modern surname has a wide variety of spellings which include Alban, Albon, Albone, Allbon, Allbones, Alabone, Allebone, Alliban, Allibon, Allibone and Aubon, as well as the later mainly London dialectals of Hallibone, Hollybone, Holybone, Hollebon and no doubt others. Examples of recordings taken from surviving church registers of Greater London include the marriage of William Albone and Margarett Alett at St. Margaret Moses, on February 25th 1587, that of Joan Hollybone to John Borland at St Dunstans in the East, Stepney, on April 19th 1620, and that of Ellen Hollebon to William Taylor at St Martins in the Field, Westminster, on October 18th 1868. Throughout the centuries, surnames in every country have continued to "develop" often leading to astonishing variants of the original spelling.